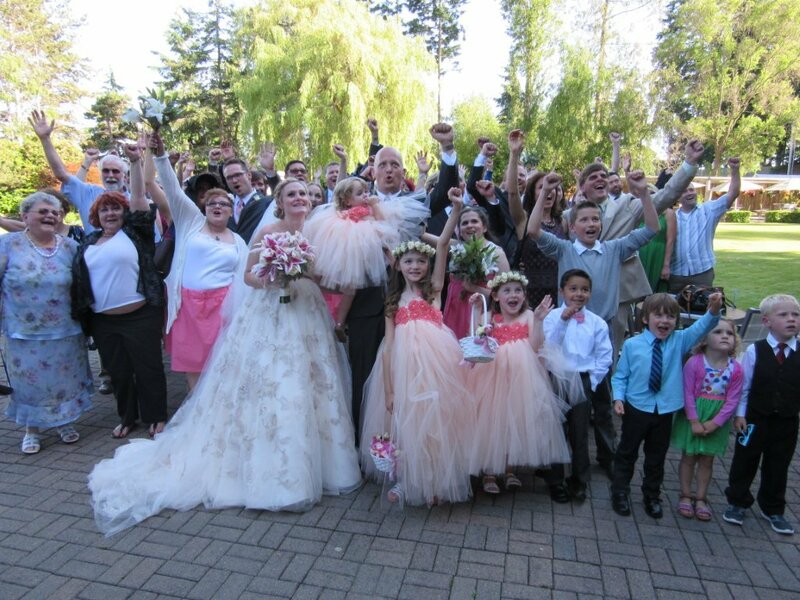 Depending on the venue and couple, one of the most wonderful and immediate “after ceremony” treats is a group photo. On a wedding day, there isn’t a better time to gather family and friends for such a big moment than once the “I Do’s” are done. Because once the reception begins, forget pulling everyone together for such a photo! On Saturday evening, Brittany and Shane were married at the gorgeous Kiana Lodge in Poulsbo. To make things easy, I went to the front of the ceremony space just before we began and after introductions, instructed the guests on “what to do” to gather for the immediate post-ceremony photo event. This sweet touch works beautifully every time! AND you do need an Officiant with strong air traffic controller skills and a great photographer to pull off a group photo with elegance and fun. As you can see, Brittany and Shane’s grroup did good…the photo is mine and not as good as F7 Photography’s will be!